I decided to take a break from pen restoration to share some old newspaper advertisements that I purchased recently and tie them to some pens I have in my collection. I enjoy looking for ephemera that relates to pen history and the advertisements below are an interesting look back. The clip on the pen is also the same one as seen on several Kraker pens seen in many posts throughout the past year. The pen shown below is a very nicer Black Chased Hard Rubber (BCHR) Drew Lever Filler. I have had it for several years. An interesting part of this pen is that the gold bands were put on the pen, over the imprint. I am not sure why, but they were clearly not on all Drew pens and somewhat of an afterthought. The pen has a very nice Warranted No. 5 nib (fine). Below, are three panels. 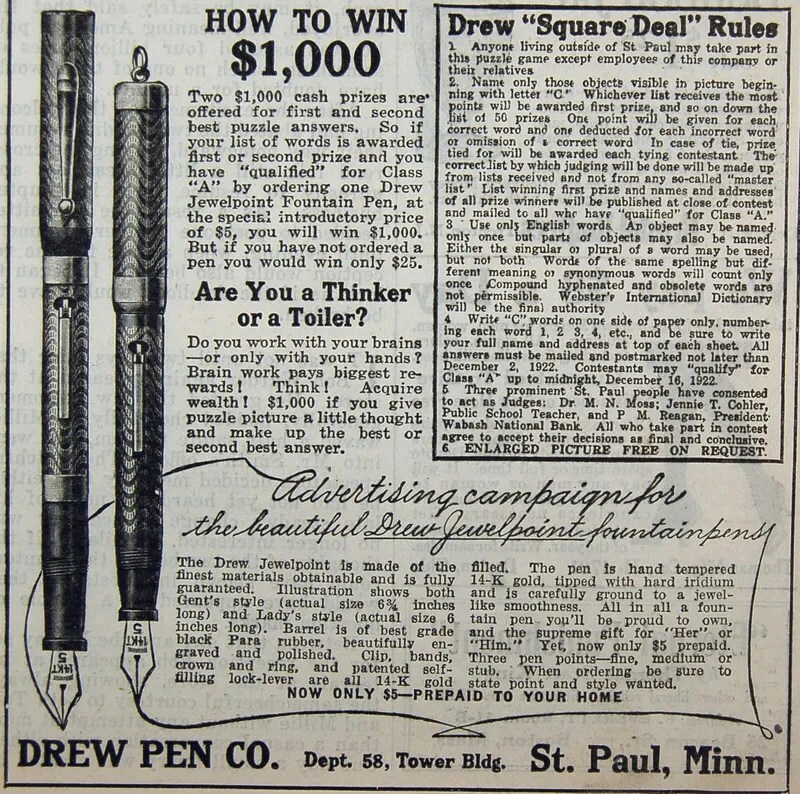 The first shows page 12 of an unknown newspaper advertisement for Drew Pens. The second and third are simply close ups of the first, separated to get a closer look. The advertisement is an eye catcher. 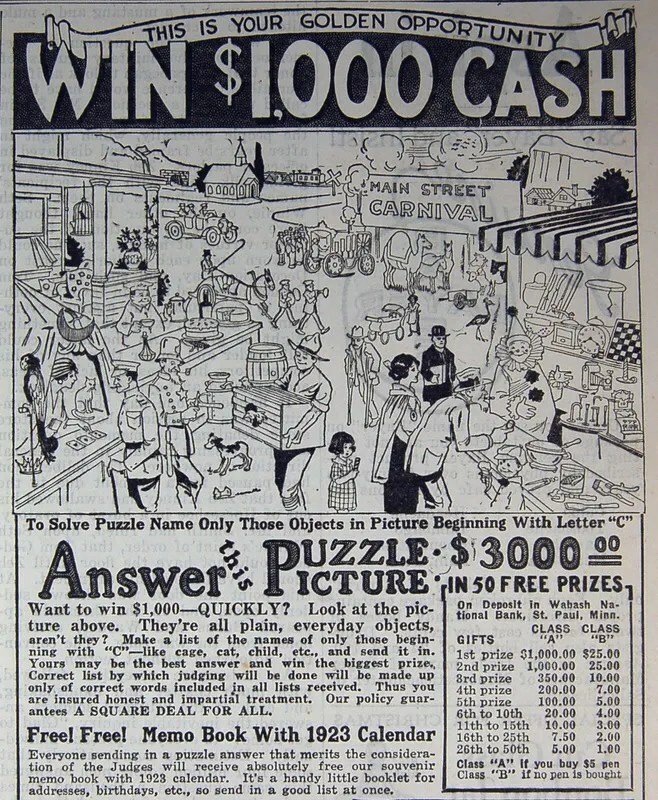 $1,000 cash (assuming you upgrade to Class A by purchasing a pen for $5) was a lot of money in the 1920s. Judges were honorable (“honest and impartial”): A doctor, a teacher, and a bank president! Clearly we were a few years ahead of the crash of 1929, and the bank president was still well respected. The pen on the left appears to be the same one that I have, above. Thus, we can place production of this pen in 1922, or earlier. Searching for this type of fountain pen related material is a lot of fun and often sheds light on the history of a pen in your collection. In this instance, it gave me a date of production that I would not have known without reading the contest deadline. Finally, if you get bored you can begin to count the C’s. Let’s see — canary, cutlery, clown…….. In my post of January 27, 2007, titled A Yankee in Michigan, I repaired and discussed a Yankee Pen made by a George Kraker pen company in Grand Haven, Michigan. In that post, I mentioned that I had a Yankee Pen from Minnesota. Well, two weeks ago, I came across another Yankee Pen, from the Minneapolis Pen Company. The clip on this one is the same as the clip used by Kraker in Michigan and on the Monogram Pen discussed on February 7. Having read several expert opinions, I am quite confident that the Minneapolis Pen Company and the Yankee Pen that I am restoring here is another Kraker product. I would place the date in the early 1920s after he left Kansas City and prior to Grand Haven, MI. The picture below is of the pen after being taken apart. The sac had reduced to a fine dust. As you can see, the hard rubber chasing is in excellent shape, as is the color and imprint. the nib and feed were very dirty and needed to be scraped (feed) and cleaned. The nib is a nice Warranted 14K with no size number. The section needed to be scraped to remove all signs of the previous sac. I installed a size 16 sac and the pen works fine. Below are pictures of the restored pen closed and posted. I want to point out the unique lever. This lever is one that appears on many Kraker pens of the period. The first photo below is the lever of this pen. You can also see the same lever on a Winter Robbins pen, featured in my post of December 7 of last year, titled Hard Rubber Midwest Style. Finally, here is another pen, a Drew Pen Company (St. Paul, MN) with the same lever again. It would lead me to believe that Kraker may have been involved in some way with the manufacture of several of these pens.